Beautiful uncancelled certificate from the Electric Company of America issued in 1902. 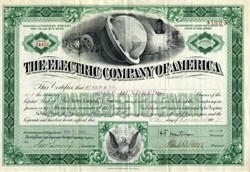 This historic document was printed by the American Bank Note Company and has an ornate border around it with a vignette of an electric light, electric generator and a globe. This item has the original signatures of the Company�s President, and Secretary, and is over 110 years old. In 1899, The Electric Company of America filed articles of incorporation. The company has an authorized capital of $25,000,000. Its expressed objects were to manufacture, produce, purchase, own, use, and sell to public and private users coal coke, gas, oil, electricity, light, heat, steam, and compressed air power, water, , and to own, acquire, construct, lease, and operate plants in connection therewith. 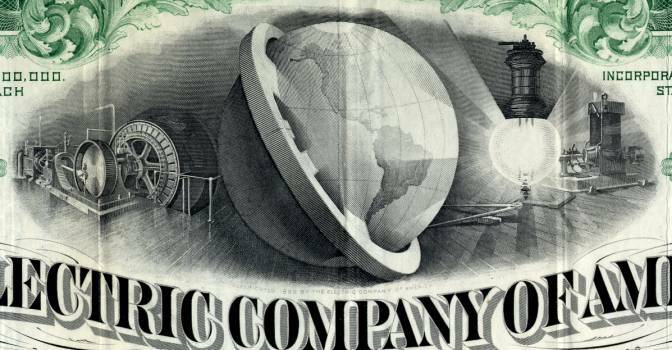 On Dec. 20, 1906, a certificate of incorporation was filed in Albany, N.Y. for the American Gas and Electric Company. The company was formed from a utility holding company, Electric Company of America, which was organized in 1899. The company acquired its first utility properties Jan. 2, 1907. These properties provided electric service, gas, water, steam, transit, or ice service in communities in New Jersey, New York, Pennsylvania, West Virginia, Ohio, Indiana, and Illinois. The company became American Electric Power in 1958, and merged with Central and Southwest Corporation in 2000.